Perce Blackborow (often given an extra "r" as in Blackborrow, he sometimes also becomes Percy) is one of the more interesting and colorful members of the expedition in that he never should have been on board the Endurance in the first place and was a stowaway - probably the only one ever on an Antarctic expedition. In 1914 he found himself far from home in Buenos Aires without a ship. 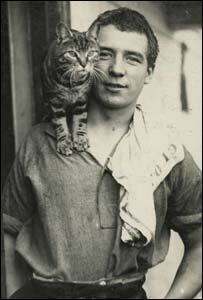 He met and befriended an American sailor, William Bakewell who was in the same situation. When the Endurance sailed into port and three of the crew were sacked, the two men thought their problems were solved, they both applied for positions on board. 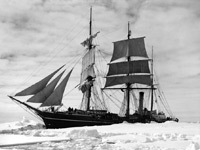 Shackleton interviewed them both and Bakewell was accepted where Blackborow was not due to his age (he was only 19 at the time) and lack of experience. He was smuggled on board with the help of Bakewell and How and hidden in a locker where his two friends would take food for him on a regular basis. He was eventually discovered when the Endurance was three days out of port, Shackleton was unhappy at him being there, but realised he had no choice and offered him a position of steward with the proviso "If anyone has to be eaten, then you will be the first!". Blackborow was quiet, stocky, quick witted and well liked, he also came to prove himself however as a very conscientious sailor. On the boat journey from where the Endurance sank to Elephant Island, Blackborow made the mistake of wearing leather rather than the cold-weather felt boots that the other men wore and as a result developed frost-bite in his toes that then turned gangrenous. Shackleton realised that Blackborow was suffering on this journey and gave him the honour of being the first person to set foot upon Elephant Island (not just from the Endurance crew, but ever - no-one had landed there before). When they arrived, he was unable to walk ashore and had to crawl through the surf. Shortly afterwards, he had all of the toes on his left foot amputated by the surgeons Macklin and McIllroy. Perce Blackborow became assistant to Green the expedition cook, in the galley, first aboard ship and on the ice, working the longest days of any on the expedition on a regular basis, from early morning till evening, preparing meals for 28 hungry men. 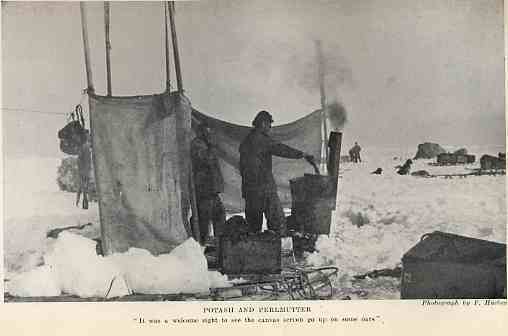 When on the ice, they cooked on a stove that was heated by burning seal or penguin blubber, a very smoky fuel which gave them permanently blackened faces and earned them the nicknames of "Potash and Perlmutter". Perce Blackborow was born in Newport, South Wales, the son of a ship's steward. 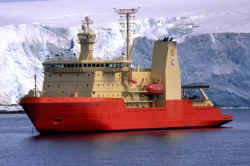 On return from the Antarctic, Blackborow spent three months in a hospital in Punta Arenas, Chile, recovering from the frostbite damage sustained to his left foot. On return home to South Wales, he was somewhat overwhelmed by the welcome party awaiting him at his local railway station and instead, crossed the tracks and went out of the other side of the station. He volunteered for war service in the Royal Navy, but was turned down due to the amputation of the toes of his left foot. He was accepted by the Merchant Navy where he served until 1919 after which he became a boatman in the local docks in Newport. He married a local girl Kate Kearns and they lived in Newport producing six children, unfortunately two of them died in childhood. Perhaps more so than any of the other expedition members, Blackborow was molded by his experiences as he was so young at the time, the youngest on board by over two years. The friendship with Walter How and William Bakewell who smuggled him aboard the Endurance lasted long after the men had returned. Even after Blackborow's death, Bakewell who had come over from Canada made a visit to Wales to meet his family. Perce Blackborow died at home in Newport, of Chronic Bronchitis and Heart disease at the age of 54. Besides the men mentioned previously, Green the cook and Blackborow my faithful friend in the pantry, are both accommodated in the fo'c'sle. They differ very much in temperaments, but both are intensely loyal to the expedition, and Sir Ernest has a very high opinion of Blackborow. He is a scrupulously clean and conscientious young fellow. For his age he is extraordinarily reliable and competent. His only enemy is his own hasty temper, but he is immensely improved since he has been in this ship. Both he and Holness take a great interest in the dogs and all outdoor exercise and games. The cook and Blackborow take their meals in the pantry. Blackborow is to be congratulated on having been able to avail himself of such skilled men as McIlroy and Macklin. McIlroy performed the operation and Macklin acted as anesthetist. All five toes on the left foot were amputated and I believe the operation was as successful as could be anticipated under such unfavourable conditions. The Stancomb Wills came up and McIlroy reported that Blackborrow's feet were very badly frost-bitten. This was unfortunate, but nothing could be done. Most of the people were frost-bitten to some extent, and it was interesting to notice that the "oldtimers," Wild, Crean, Hurley, and I, were all right. Apparently we were acclimatized to ordinary Antarctic temperature, though we learned later that we were not immune. This was the first landing ever made on Elephant Island, and a thought came to me that the honour should belong to the youngest member of the Expedition, so I told Blackborow to jump over. He seemed to be in a state almost of coma, and in order to avoid delay I helped him, perhaps a little roughly, over the side of the boat. He promptly sat down in the surf and did not move. Then I suddenly realized what I had forgotten, that both his feet were frost-bitten badly. Some of us jumped over and pulled him into a dry place. It was a rather rough experience for Blackborow, but, anyhow, he is now able to say that he was the first man to sit on Elephant Island. Possibly at the time he would have been willing to forgo any distinction of the kind.